A.J. 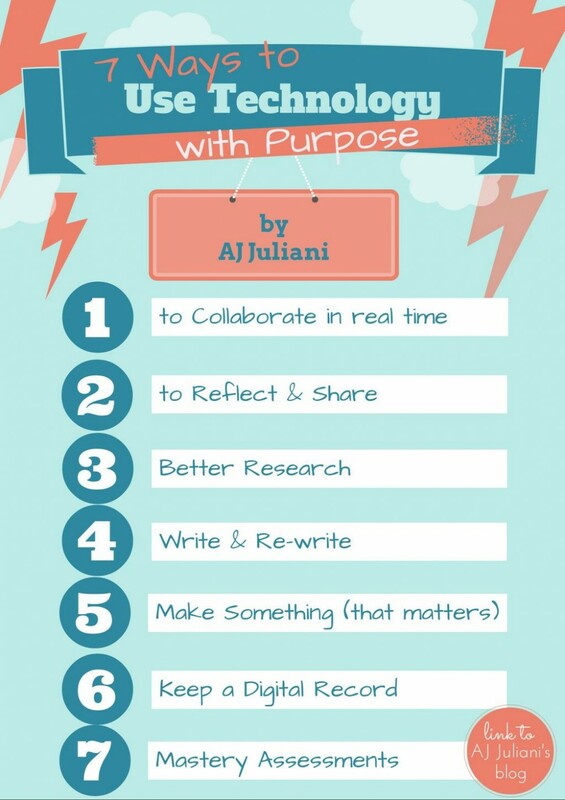 Juliani created this invaluable infographic to make sure you are using technology the right way. If your students understand the “why” behind your technology use, then the class will have a purpose and technological glitches and issues can be worked through. If they don’t understand the “why” then any small issue could turn into a major problem. Students writing and sharing in real-time, able to see what the other students are doing and saying, while still working on your own part of the project or activity. Having students journal online and shared “in the cloud” offers the ability for their classmates to see what they have to say. Technology has made research simpler and more time efficient. A nice search phrase in journal databases will turn up hundreds of peer-reviewed results which can be sorted many different ways (such as by date or full-text article). Using tools such as Google Docs, the new Microsoft Word, or Draft students are able to write and edit on the fly. They can get feedback from peers and teacher and then choose whether or not to accept that feedback on their writing. Students now have the ability to make movies, songs, pieces of art, websites, apps, games etc–with technology. However, too often we ask students to make something that does not matter. Digital portfolios are a must because they show learning growth. The best way to show how much a student has learned is through a digital portfolio. You can look back over time and what they’ve created, written, and done in school. If you give students digital assessments you are be able to see exactly which questions they get wrong in comparison to the entire class. You can see how much time they spend on each question and if the answers they choose are way off base or close.